By all external measures, Google’s PageRank is dead. Google announced that they are no longer providing public PageRank updates. Which means anyone still talking about PageRank as a metric for SEO is focusing on an outdated metric. Actually, if you think about it, it’s quite comical. Here some SEO company promised you an increase in PageRank and for the life of them, they can’t get that bar to move! Well, duh! When something isn’t being updated, no matter how hard you try, it’s not going to change. 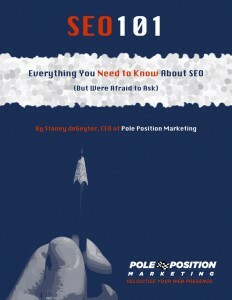 Now, PageRank still exists and is still a factor in Google’s algorithm. We just don’t get to know what the PageRank of any page is ever again. So talking about it like it’s something you can measure is just futility. Ultimately, that’s not a bad thing because PageRank was never really much of a useful metric of success anyway. Yeah, it did help SEOs assess pages, but too many people would focus on growing PageRank over growing their business. They would see their sales increase but look at that PR bar and say, why did our PageRank go down? Really? Who cares? That’s not what brings in business! Any SEO still talking about PageRank as a valuable metric of success is blowing something worse than smoke. Either their pants are on fire or they are just so far behind in the world of web marketing that PageRank is probably the least of your concerns with them. Stoney, I totally get your point, and I hope that anyone selling SEO services know that this is not a metric to base a campaign on. One thing I do is have a toolbar so that I can simply assess whether or not the site had a decent (toolbar) PageRank prior to Google stopping the updates. It let’s me know how strong they were considered by Google at that time. Of course, the farther away we get from the date when they stopped updating, means this has less relevance, especially if they have not kept up with their online marketing. For example if there is no page rank or a PR of 4, that is a sign that at least they did something proactive.